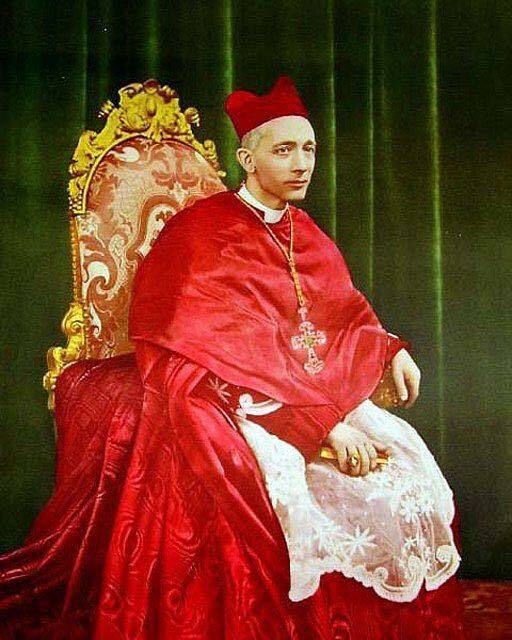 We never let August 30th pass without remembering the Blessed Cardinal Alfredo Ildefonso Schuster, who went to his eternal reward on this day in 1954, after serving as Archbishop of Milan for just over a quarter of a century. We have written about him many times on NLM, partly in connection with our interest in the Ambrosian liturgy, of which he was a great promoter, but also as one of the most notable scholars of the original Liturgical Movement. 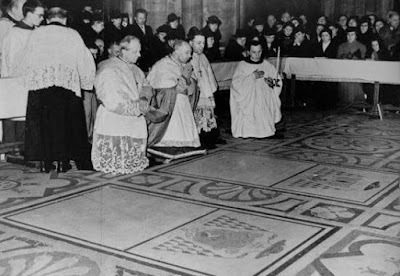 His famous work Liber Sacramentorum, known in its English translation as The Sacramentary, was written while he was still a Benedictine monk of the Roman Rite, and although inevitably dated in some respects, it remains an invaluable reference point for liturgical scholarship. 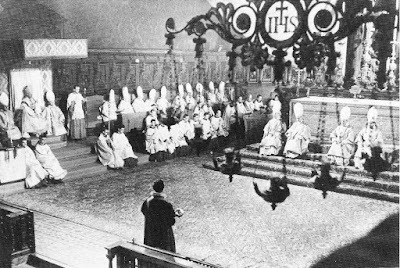 Pontifical Mass on the feast of St Charles; the mitred canons sitting on the steps of the altar are the deacons and subdeacons who serve the Mass, apart from those at the throne. Preaching from the great tribune pulpit of the Duomo. 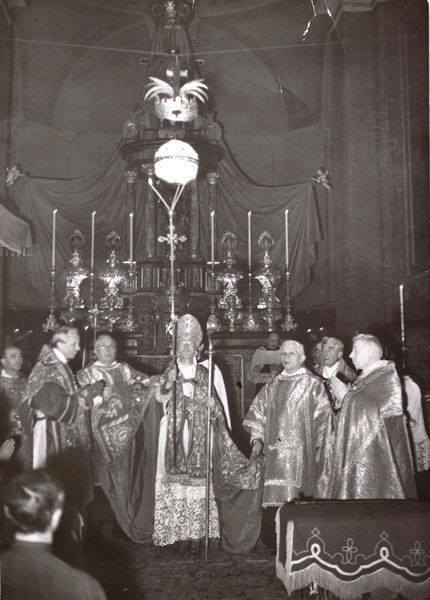 Lighting the faro on the feast of St Sebastian. During the difficult years of his episcopacy, the years of Italian Fascism and World War II, during which Milan was one of the hardest hit cities in Italy, the Bl. 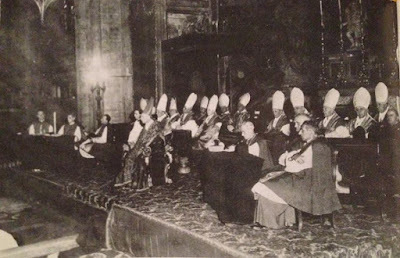 Schuster showed himself in every way a worthy successor of St Charles Borromeo, shepherding his flock in much the same way, visiting every parish of the diocese five times (occasionally riding on a donkey to some of the more remote locations), holding several diocesan synods, and writing innumerable pastoral letters. 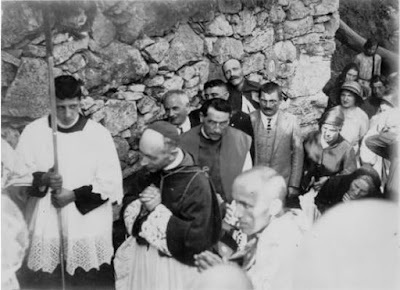 Pastoral visit to the village of Valsolda. Praying at the tomb of Card. 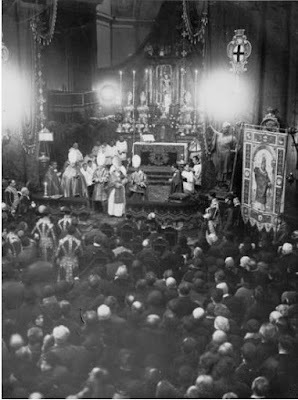 Andrea Ferrari, archbishop of Milan from 1894-1921. Card. 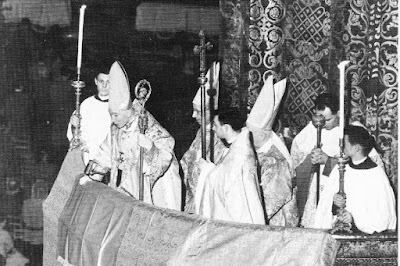 Ferrari was beatified on May 10, 1987; his relics are now in an altar in the right aisle of the Duomo, right next to that which contain the relics of Bl. Schuster. Card. Schuster, accompanied by three mitred canons of the cathedral chapter, assists from the throne at the Pontifical Mass celebrated by the Archpriest of the same chapter, during the traditional presentation of candles in the “Tempio Civico” (civil temple) of St Sebastian on the patronal feast. The mayor of the city and other dignitaries are also present; the official banner of the city, with a famous image of St Ambrose, is seen on the right. The Tempio Civico was built by the city of Milan in 1576 as an ex voto for the end of a particular severe outbreak of the plague, one in which St Charles famously ministered to the sick and dying with his own hands. 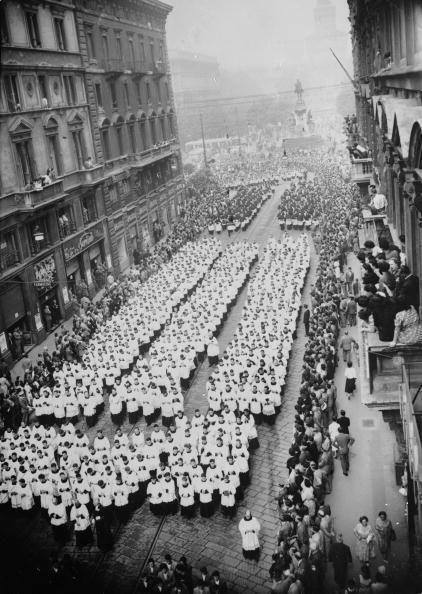 Candles are presented to the church by the city as part of the annual commemoration of the end of the plague; the devotional life of Italy is still to this day rich with such festivities. 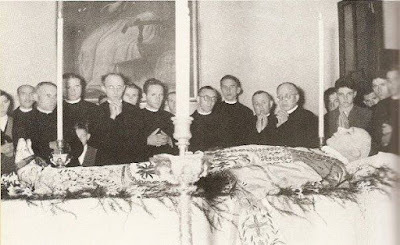 His body lying in state. 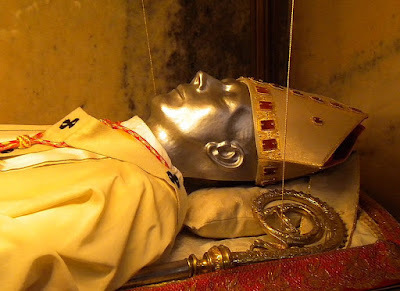 When his tomb was opened in 1985, his mortal remains were found to be intact; he was beatified by Pope John Paul II in 1996, and his body was exposed for the veneration of the faithful in one of the side-altars of the Duomo. Beate Ildephonse. Beate Ildephonse, ora pro nobis!